Founded in 1973, Groveland Gallery features the best of Minnesota and regional art with a special focus on contemporary representational paintings, drawings and prints. We sell only original art and have a personal relationship with the artists we represent. Work by our artists is included in private, corporate, and museum collections throughout the United States. The gallery hosts two exhibitions simultaneously and changes shows every six weeks. Artist talks and demonstrations are frequently offered to complement exhibitions. Opening receptions are held on Saturday afternoons and are always free and open to the public. In addition to exhibitions, we maintain a large inventory of artwork ranging from small drawings to large-scale paintings. 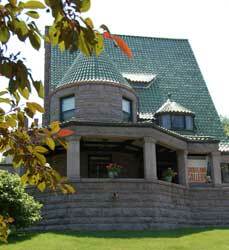 Groveland Gallery is located on the first floor of the Frank B. Long House, which was built in 1894. Long and his partner, Frederick Kees, ran a prominent Minneapolis architectural firm in the 1890s. Long & Kees are best known for designing the Lumber Exchange Building and the Hennepin County Courthouse, two iconic Minneapolis buildings. Constructed of Ortonville granite from Southwestern Minnesota and built in the then-popular style of Richardsonian Romanesque, the Long House carries a striking resemblance to the courthouse, which was built at the same time. The building is listed in the National Register of Historic Places. Our staff is familiar with each of our artists’ work, and can provide you with information about their careers, their techniques and their unique approaches to making art. We are committed to the tradition of nurturing and developing the careers of local and regional artists. We are confident in the aesthetic, integrity and craftsmanship of the artwork we represent and sell only the highest quality artwork. Enthusiastic about art and our artists, we enjoy sharing our appreciation of art with gallery visitors. Sally Johnson has been the director of Groveland Gallery since 1983. She curates gallery exhibitions, selects artists for representation at the gallery, and works with clients to develop collections. 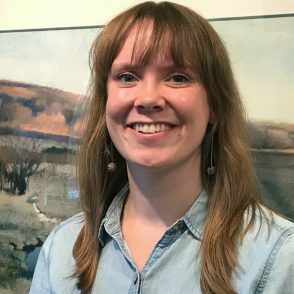 In addition to her role as director of Groveland Gallery, she has acted as the consultant for numerous corporate collections. 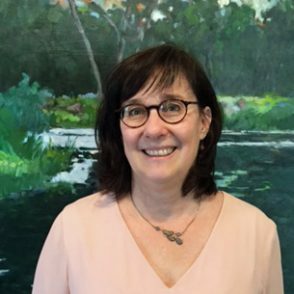 Sally is actively involved in the Twin Cities art community and is a frequent advisor and guest curator to various arts organizations, colleges, and art centers throughout the region. coordinates, curates and installs exhibitions in addition to assisting customers with acquisitions and collections. Michelle received her B.A. in business with minors in studio art and art history. She is currently completing her M.A. in art history with a Certificate in Museum Studies at the University of St. Thomas in St. Paul.